Not only is the marathon, well, a marathon physically, but it’s also a mental marathon, too. Most marathon training plans are at least 16 weeks long, and they’re often 20 weeks or even longer. Over the course of the four marathons that I’ve trained for (#2, #3 – a DNF, and #4), I’ve learned a lot about how I experience marathon training mentally. And, let’s be honest—the marathon may even be more of a mental feat than a physical one. In my mind, there are # stages of marathon training. If you’re training for a marathon, or if you’ve run one, I’m sure you can relate! You’ve just signed up for your marathon, which might even be your first marathon. Or, if it’s not your first, you’ve conveniently forgotten how hard those last few miles are and you’re ready to do it all over again. Either way, you’re chomping at the bit to start training. 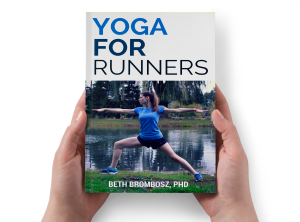 You spend hours reading through books about marathon training and maybe even make it to page 23 of a Google search for marathon training tips. (Seriously, who makes it past the first page?) You stock up on gels and maybe even invest in a new pair of running shoes. Or, if you’re like me, you splurge on a new outfit or two, because if you’re going to be spending hours training in an outfit, you’d better look good in it. Plus, technical features and all that. Once you get a few weeks into training, you’re feeling good. The cumulative fatigue hasn’t taken its toll on your body yet, and your legs are still feeling pretty fresh. You still enjoy waking up early to go on your runs, and you don’t totally hate running on the treadmill to the same playlist you’ve heard a billion times. You enjoy the mileage and are doing just fine with the long runs as they slowly creep up in length. You remind yourself that 14 miles is just barely longer than a half marathon, which is a distance you’ve probably covered at least a few times in your running career. You know you have a lot of mileage ahead, but you feel confident that you’ll keep up. The highest mileage weeks are so tough mentally. You might feel like all you do is run, foam roll, eat to refuel, and sleep. Taking care of yourself and your body becomes a top priority. If you haven’t been getting them already, now is a great time to invest in a sports massage from someone who really knows his or her stuff. Taking care of adhesions and muscle knots now could save you from an injury. You may find yourself wondering why in the heck you thought running a marathon was a good idea in the first place. (Don’t worry, you’ll be wondering the same thing again around mile 20 on race day.) But, you’re this far along, you might as well stick with it for another tough week or two, and then you’ll get to ramp down into your taper. I think there are two main types of people when it comes time to taper. The first type, which includes me, is excited to be backing down from the high mileage. If you’re a morning runner, you’re probably excited to get to sleep in a bit. (“I can wake up at 5:30 am to run 6 miles instead of 4:30 am to run 14? Excellent!”) You suddenly have more hours in the day, which means your loved ones and pets start to remember that you exist again. 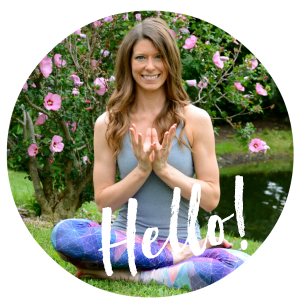 You get to enjoy your body healing itself from all of that mileage, which means you’re starting to feel good, too. The second type doesn’t know what to do with this thing called free time. They’re so used to spending hours upon hours every week on the road, or recovering from runs, or getting ready for runs. These are the people who experience the taper crazies. They start to obsess over every little twinge they feel, especially if that twinge is anywhere near a leg. They worry that any minor misstep could mean not meeting their marathon goal, or worse, not making it to the start line. Race day is finally here. The week of the race can be particularly hard mentally. Sometimes you know you’re ready and you’re just confident and happily excited. Sometimes you’re not sure how your body will hold up, and you’re terrified about how you’re going to make it 26.2 miles. Your mind will be racing (pun intended) the day and night before the race. You’ll double check your mental list of the gear you’ll need for race day at least 10 times. You’ll obsess over what you should eat that week and how to make sure you’ve properly carbo loaded. You’ll wonder if you should have gotten a new pair of shoes. (Hint: your race day shoes should have about 25-50 miles on them so they have lots of cushion, but you’re not wearing something new on race day.) You’ll run through every possible thing that could go wrong about five times in your head. But, when you finally get to the start line, try to put all of those thoughts out of your head. Focus on enjoying the moment. You’ve worked really hard for this, so go out there and make the most of your training. Listen to your body, and enjoy the run. 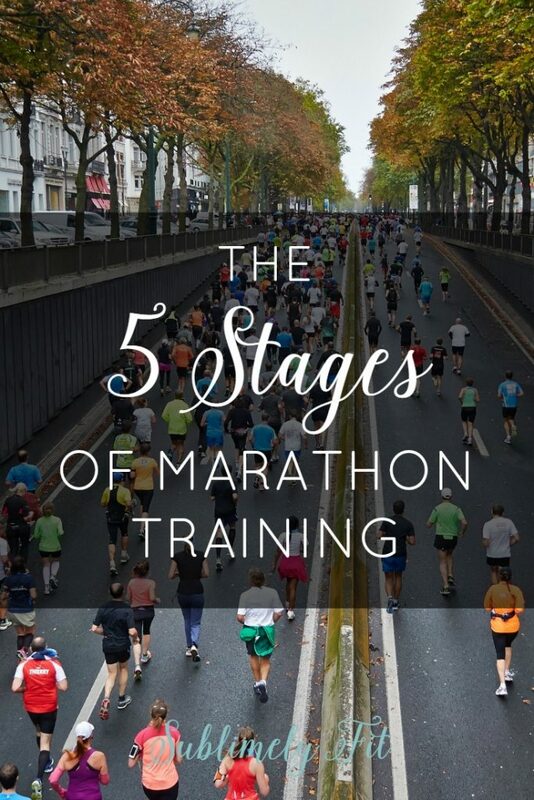 I most definitely went through all of these stages during marathon training. It really is exhausting both mentally and physically! It seriously is! That’s why I think it’s still going to be a while before I decide to train for another. It’s a huge undertaking! Sheer terror definitely is applicable to the prerace days! Hahah. Sheer terror. Totally sums it up! Haha, right? All you can do is embrace it! Oh yes, I know this cycle well. Just entered the taper. I’m always so happy for the taper, but then I get more and more nervous as I lead up to the race and question everything and think I should run more. Right? It’s such a mind game. Good luck with your taper!! Annnnnnd right at this very moment – – literally not even metaphorically 🙂 – – I am stuck at stage number three!!! I agree with you. It seems these 5 stages that always appear in the races. ^^ Frequently, I don’t pay attention to the #5 stage. Tell me your secrets, Vicky! I always get so nervous before and during the first few miles of a marathon. Any tips for overcoming the “sheer terror”? I am so glad to see you back and blogging. These are all so true – I am trainingf or #6 right now. Aw, thanks, Abby! I’m glad to be back. Hope the rest of your training for your next marathon goes well and that you’re able to finish strong in spite all of that adrenal business!